A great variety of plams and cycads for your garden. Slender tropical Palm to 6m or more with silver reverse to the fronds & thin graceful trunk. Excellent tub specimen. Slow at first, moist sheltered site in sun or shade. Majestic tall single trunk palm. Long pendulous spikes of red fruit which are eaten by some birds. Good in wet soils or normal garden soils. Sun or shade. CE.Q’ld to SE.NSW. Attractive Palm Lily to 2m. Numerous small lilac flowers followed by clusters of bright red globular berries. Fairly fast, prefers moist site in shade or semi-shade. A tall Palm Lily forming clumps to 5m. White to purple flowers on branching stems, followed by bright red berries. Hardy, requires a semi-shaded position. Excellent tub plant. A slender Palm Lily forming small clumps to 2m tall. Numerous small lilac flowers followed by clusters of bright red globular berries. Most soils, shade or semi-shade. SE.Qld & NE.NSW. 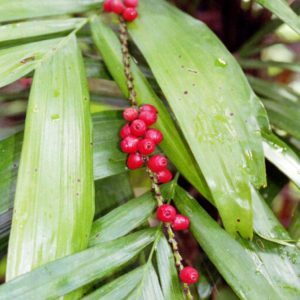 A palm-like foliage plant with long narrow leaves to 30-60cm. Useful understorey shrub for shady areas. Sprays of blue flowers in summer followed by black berries. Qld & NSW. Cycad from Rollingstone north of Townsville, locally abundant in grassy woodland and well conserved in Mt.Spec National Park. Forms a trunk to 1 to 3m with leaves to 1.5m long. Grows in an open site in full or dappled shade. Well drained soils, keep moist in summer & dry in winter. Male & female cones on separate plants. This is our local cycad. Large native cycad which forms a stout trunk to 2m. Long leathery dark glossy leaves to 1.5m long. Slow & does best in warm semi-shaded well drained site. Good indoor. Attractive understorey palm to 3m. Showy pendulous spikes of cream flowers & edible red fruit. Slow growing. Needs a protected shady moist site. SE.Q’ld & NE.NSW. An attractive Fan Palm with prickly leaves & often grows in colonies in wet sites. Slow at first but hardy in sun or shade. Small cream flowers, black globular fruit. SE.Q’ld to E.Vic.